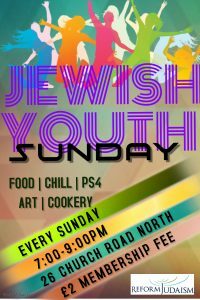 I am delighted to announce that the Reform Shul will be launching a weekly youth club for young people who are in Years 8 and above (11-18yrs) from 17th February 7-9 pm. The club will run Every Sunday 7-9 pm. Membership fee £2*. 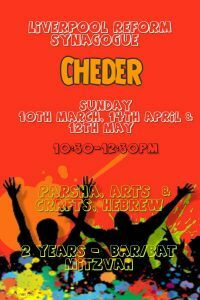 Open to all Jewish Children from across Liverpool aged 11+, and they can bring one non-jewish friend. The youth club will provide activities and a place to chill for young people. The club is staffed by trained education and youth workers, and a support team of volunteers. The club will offer a range of activities as we have been lucky to secure extra funding from the Movement for Reform Judism. Please let your children and grandchildren know, and share with friends. A proper poster is coming soon! If you have any questions, or you would like to volunteer at the club then please feel free to contact us on 07990 573652 or email youthclub@lrshul.org.